Management of infrastructure upgrades and reconstruction of 800,000 sft. of commercial retail. Management for the renovations to 42,000 sft of The Woodbridge Company Corporate Head Offices. Currently managing the power distribution upgrade of building. 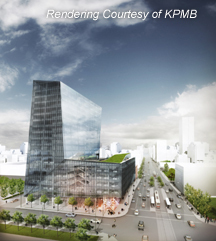 Management for a 110,000 sft expansion of existing building on Bay Street. The addition of 6 levels of residential to an existing 10 storey commercial building. Construction of a below grade parking/retail structure, 4 storey retail podium and 71 storey residential tower. Management of an Infrastructure Ontario Project which included renovations of existing building, roof replacement, window refurbishment, energy audit and abatement program. Management for the build of a 460,000 sft. building for the Globe and Mail new headquarters at Front Street and Spadina Avenue.